It is not a difficult choice for me to list the three books that I want to read. 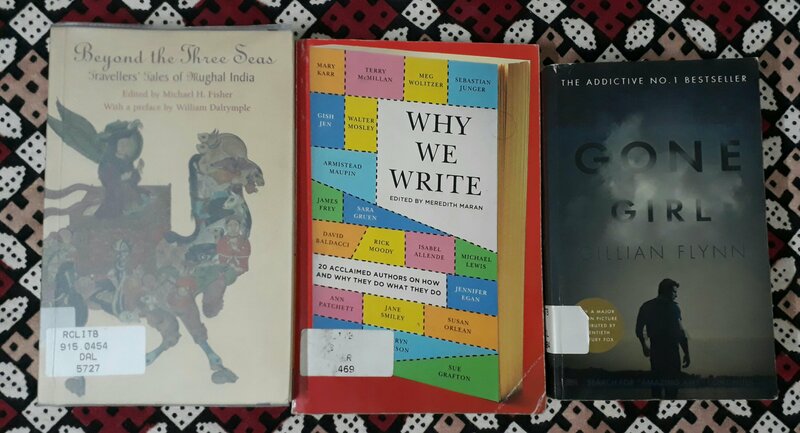 In fact I wanted to read these books so desperately that I got them one month back from the library and since last three weeks they have been gathering dust. The first one is : Beyond the Three Seas – Travellers’ Tales of Mughal India. It has been edited by Michael H Fisher with a preface by William Dalrymple. I read a couple of chapters of this book before being swept by the flurry of March activities starting from the ‘ides of March’. This is a compilation of first hand account of various European Travellers to India during Mughal period.The book promises to provide glimpses into Indian History not found in text books. After I finish reading the book I wish to share my impressions to the readers of my blog. The second one is – Why We Write. This book too is a compilation of thoughts of various authors on the question the title poses. This book should be of interest to all writers and I am no exception. The third book- Gone Girl- is a work of fiction by Lilian Flyn. Having watched the movie earlier, the main reason I chose this bestseller book was just my curiosity to compare the book with its celluloid version. Secondly, I haven’t read any popular fiction title for a long long time and I want to break that dry spell. Had I not visited the library I don’t think I would have come across these books – particularly the first one. That is the beauty of going to a library full of printed books, as against an online store or library. Online searches or stores would hardly ever suggest you anything that is not linked to your keyword. There is hardly any scope of surprise when you search for things online. If one has developed a love for reading one cannot restrict oneself to text books. As my title of this post suggests, text book reading is reading out of obligation. Even for those who want to excel in their academic fields, they have to read stuff beyond text books to deepen their knowledge and see things from different perspectives. Great reading list. I envy you that you have access to a library. Thank you. I think every place has some public library nearby. Not where I live. Delhi Public Library used to have branches. I think fund cut has restricted them. In C. R. Park, there used to be library. But in general, library culture, other than college library, is missing in this part. For a lover of books, that is the best ‘time pass’ during vacations. Thank you so much for stopping by. Anna Quindlen says, Books are the plane, and the train, and the road. They are the destination, and the journey. They are home. That is a marvellous quote. The power of written word makes one feel all these – the journey, the destination, and home. Thanks a lot.